Here is the last part on how to beat jet lag in 15 ways. Have fun on your trip! 11. STAY ON HOME TIME. If you’re going to be away from home for only a couple of days, stay on the same eating and sleeping schedule while you’re away as you would at home. If you normally have dinner in Atlanta at 8:00 P.M. for instance, when you fly to Los Angeles for two days of business meetings, have dinner at 5:00 P.M. You’ll not only avoid that dragged-around-by-your-hair jet-lagged feeling, you also won’t have trouble getting a good table at the restaurant of your choice. 12. OR SWITCH IMMEDIATELY. If you’re away for more than just a couple of days, don’t just set your watch to local time when you arrive—help reset your internal clock by eating, going to bed, and waking at the local time as well. 13. BRING YOUR WORKOUT GEAR. Most hotels have exercise rooms and lap pools. Schedule a 30-minute workout each day you’re on the road. You’ll feel and sleep better. 14. WATCH OUT FOR FUZZ BRAIN. Avoid driving long distances and making critical decisions for the first 24 hours after you arrive. 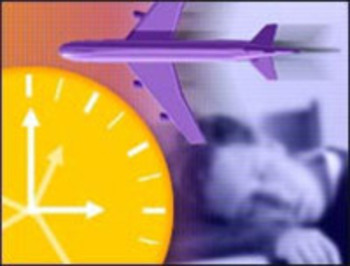 If you’re the least bit fuzzed by jet lag, your ability to think and react will be impaired.